All the Galaxy S7 and S7 Edge variants have already been updated to Android 8.0. If you are wondering whether the Oreo OTA update for Galaxy S7 is worth it, then the answer is – YES, absolutely! It brings Samsung Experience 9.0, which is a new TouchWiz firmware update. The new Samsung Experience 9.0 comes with numerous customization options, battery optimizations, and stability improvements. 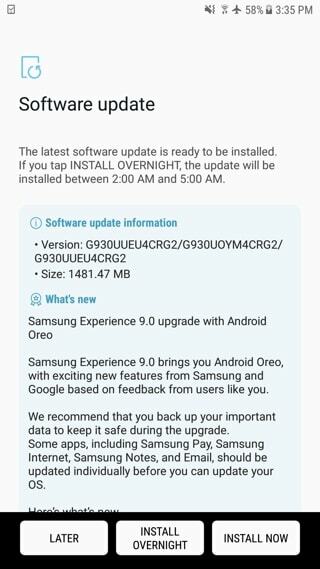 Finally, the Unlocked variants of the Galaxy S7 (SM-G930U) and S7 Edge (SM-G935U) are receiving Android 8.0 Oreo software update. Oreo for Unlocked S7 (Edge) features new firmware build number (or Baseband version) G930UUEU4CRG2 and G935UUEU4CRG2 respectively. Although it may not be the latest Security Patch, April 2018 OTA is still worth it. The devices will soon receive the latest July 2018 OTA. You can now use the Google Camera Mods for Galaxy S7; as the latest Google Camera APK only targets Oreo. Moreover, you get even more stability with SABS or Adhell 3.1; which are Knox based rootless systemwide AdBlockers, Package Disablers, and Permission Monitors. If you have a SIM unlocked Galaxy S7, and still haven’t received the OTA update. Then your best best is to download the full stock firmware TAR file and flash it using the latest Odin tool. 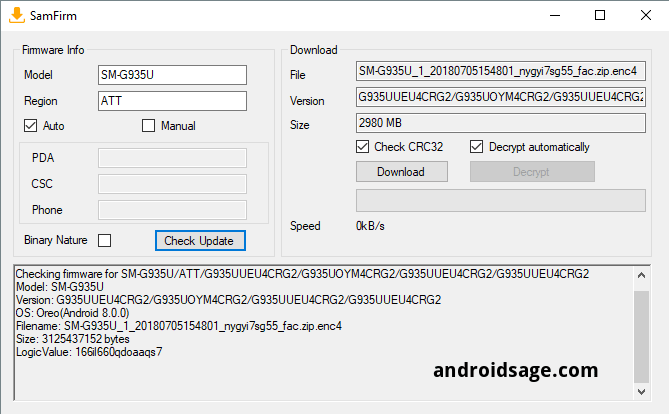 Download and extract the latest Samsung Firmware Download tool to PC. Find out the CSC code or Product code for your specific region. See below to get the code for Unlocked. Run the SamFirm tool and input the model number and CSC code, as shown in image below. Check and download the latest stock firmware for Unlocked Galaxy S7. See How to install stock Samsung firmware using Odin tool? Previous Entry LG V20 Gets Android 8.0 Oreo Update – Download Now!